Home / Bar Buzz / Bar Buzz: No-conflict divorce? The Family Law Mediation Task Force that would form under House File 1744 would also offer lawmakers ideas for implementing conflict resolution and making divorce a less adversarial process. 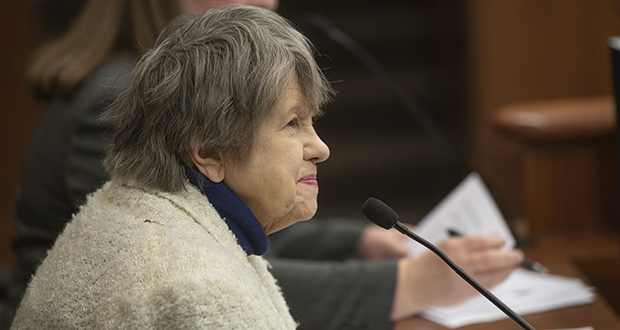 The Bureau of Mediation Services would provide staff, support, office space and administration to the effort, according to the bill’s House author, Rep. Sandra Masin, DFL-Eagan. Speaking to the House Judiciary committee on March 20, Masin said studies consistently show that kids who endure divorce generally exhibit more behavioral and emotional problems, achieve less academically and struggle more with social relationships than do their peers. Parents who go through adversarial divorces, meanwhile, often suffer from depression, anger and loneliness, she said. She hopes the task force ultimately helps steer parents toward client-centered mediation that is less hostile—and less traumatic—than courtroom proceedings. As currently contemplated, the task force would have 16 members. Two would come from the House and two from the Senate. The State Bar’s Family Law and Alternative Dispute Resolution sections would be represented, and one family court referee, one district court judge and a retired judge appointed by the state Supreme Court’s chief justice all would be empaneled. The group also would include representatives of the Academy of Professional Family Mediators, the Association of Family and Conciliation Courts, the Minnesota Psychological Association and various other stakeholder groups. The Masin bill has two GOP co-authors—Rep. Peggy Scott, R-Andover, and Rep. Glenn Gruenhagen, R-Glencoe. If it is enacted, the task force would begin meeting on Aug. 1, 2019, and submit a report to relevant legislative committees by Jan. 31, 2020. Its meetings would be open to the public. The bill, as amended, passed through Judiciary committee in a unanimous March 20 voice vote. It was referred from there to Ways and Means. A clone bill, House File 2318—also authored by Masin—cleared Government Operations on March 13. The bill’s Senate companion, Senate File 1829 (Sen. Greg Clausen, DFL-Apple Valley), also made its way through the State Government Finance and Policy and Elections Committee on March 13. It was referred to Senate Judiciary but that committee has yet to hear it.